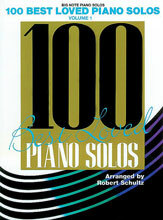 One hundred titles in six categories: pop hits; movie and TV music; pop, rock and country classics; folk and children’s songs; classical themes; and all-time favorites. Titles include: All for Love * I Swear * Charlie Brown Theme * Looking Through Your Eyes * Star Wars (Main Title) * Talk to the Animals * Journey to the Past * Tradition * To Life! * As Time Goes By and more.